In the spring of 1888 the young inventor and self-taught engineer Frederick Fuller (see biography of Frederick Fuller) of Waterbury, Connecticut, saw a model of cash register, while working in the shop of the Specialty Manufacturing Company, a firm engaged in a special brass work, models of inventions, clock movements, etc., owned by the Griswold family. Fuller was assigned to work on parts of the model, ordered by another inventor, and came to the conclusion, that there were many ways in which a better cash register could be made, and one day he made bold to say as much to the owner, Mr. George G. Griswold. "Do you think you can make a better one? ", asked Mr. Griswold. "I don't think I can. I know I can. ", answered Fuller. Thus the owner put him to work on his ideas and also assigned his son George H. Griswold (born 1855) to work with him. This was a great break for both young men, they became fast friends and went at their new task with so much enthusiasm that in less than a year they had perfected a machine and applied for patents on a device, that was destined to play an important part in cash register history. Fuller and Griswold applied for the patent on 4 April, 1889, and it was granted on 4 February, 1890 (US patent 420554). Several months after filing their original application, they discovered a method of indicating cash amounts which they believed would result in a better machine. Accordingly they filed a second application, and obtained another patent (US patent 420555). The inventors succeeded in interesting a number of Waterbury men who took stock in a company to make and market their cash register. 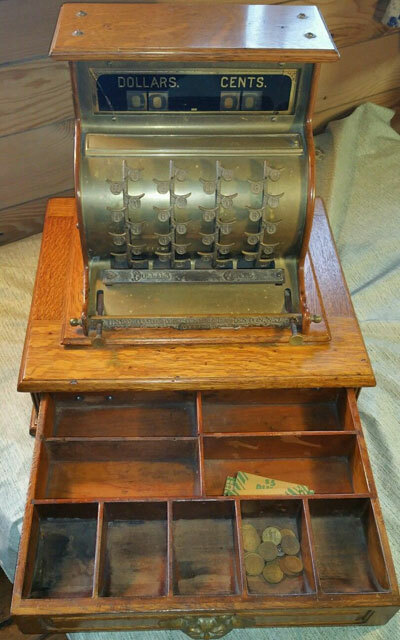 This was the first Union Cash Register Company. They started out in a most modest manner. Lacking money to tool for extensive production, they made all machines by hand. By the time they had made and sold about 75 registers, they ran out of capital and credit. To raise more money they moved to city of Trenton, N. J.
George Griswold entered the sales department, while Fuller kept on as superintendent of the plant. The basic difference between the Union cash register and the others on the market at that time was that Union machine was deliberately designed for use in general lines of retail business, whereas the others were made for and sold to saloons. The Union was a success from the start. Even in Waterbury, while they were turning out their first handful of machines, they were becoming known. 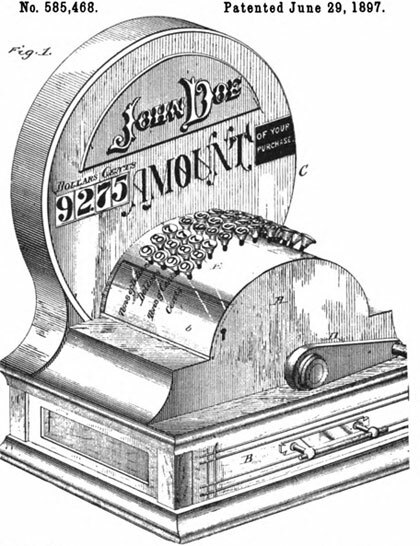 In 1892 Union Cash Register was awarded the John Scott Medal of the Franklin Institute, which had an asset of great advertising value. Let's examine the cash register of Fuller and Griswold, using the patent drawing (see the image below). 1. To provide a machine which shall temporarily indicate the amount of each sale, so that the customer may see the same as it appears upon the face of the machine, and which shall, in addition to the temporary indication thus made, transfer the amount of said sale by a process of addition to a permanent totalizing-register, which may be inaccessible to the salesman, and which will at all times show the sum-total of sales to any person having access to the interior of the case without any calculation upon the part of the observer. 2. To provide a machine in which any of the several parts of the permanent registering mechanism may be operated forward, but in which none of said parts is capable of any retrograde movement. 3. To provide mechanism whereby upon the opening of the cash-drawer the indicating mechanism will return to its normal position and the said indication be effaced. 4. To provide means for locking the next higher segment as against simultaneous operation with the one below it. 5. To provide a construction which shall be cheap and simple in all its parts, certain in its action, and positive in operation as far as may be. In the operation of the machine organized as above described the operator places his fingers upon the appropriate handle of the proper segment and depresses said segment until the fingers come in contact with the table. This causes the amount corresponding to the handle selected to appear upon the indicating-wheel, which shows through the appropriate opening in the case. It also causes the same amount to be added to the totalizing-register, and the segment is retained in the position to which it has been carried by the engagement with the sector-teeth thereon of the spring-actuated clicks. Of course in registering uneven amounts the depression of more than one segment is required-say for $3.47 the units-segment is pressed downward from seven, the tens from four, and the hundreds from three, which may be done freely so long as it is not sought to depress them simultaneously. Even amounts are indicated and registered by means of one segment only. For instance, for eight cents, the units-segment is depressed from eight; for eighty cents, the tens-segment from eight; for eight dollars, the hundreds-segment from eight, etc. When the drawer is opened, the cam-slots therein, by moving the rod which operates the clicks, causes these latter to be disengaged from the segments, which, carrying with them the indicating-wheels, return to their normal positions. While the indicating-wheels are always at zero, except at such times as they are depressed and so retained by the clicks, the totalizing-register has added to it at each operation of the segments, or any of them, the amount thereby caused to appear upon the indicating wheel or wheels. 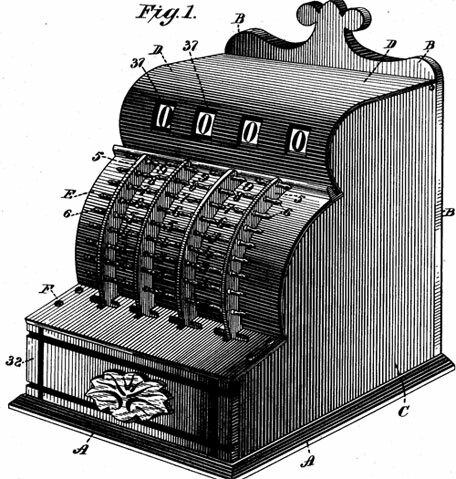 The person having access to the interior of the case may therefore obtain the full amount of sales at any time by reading as a total the figures on the totalizing-register wheels which are in the line for totals, which line maybe indicated by marks upon the sides of the ease or in any other desired manner. When at any time it is desired to turn the totalizing-register to zero for commencing a new account upon the machine, it is only necessary to turn each totalizing-register wheel, beginning with units, by means of its segment, until it stands at zero. 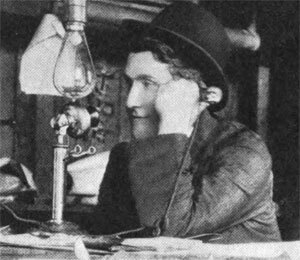 In order to make available to more users the principles behind his first cash register, Fuller devoted his next research toward a simple cash register that could be sold at a lower price, while retaining many of the unique and excellent features of the original machine. The result was a machine with a clearly legible customer reading chart, simple in design and operation (see the image below), patented in 1897 (No. 585468). In the same 1897 Fuller invented another improvement to the cash register which was described in the patent application No. 585565. In 1890s the Union kept steadily at the job of improving the register. Fuller perfected and patented a printing mechanism, and also a device which would give a printed receipt to the customer. Union however was continually at a disadvantage because their financial setup was never as good as the register they made. They had several reorganizations, and the company remained solvent, but there never was enough money to do things in a big way. By 1907 they had thousands of cash registers in service, and by this time they had attracted the attention of the great National Cash Register Co. of Dayton, Ohio. National acquired the Union company and incorporated many of the features of the Union Cash Register in its own product.